BJP could not have hoped for a better setting to celebrate the Modi government's second anniversary. The results mark the revival of its `Congress-mukt Bharat' project, while boldly underlining its own political ascendancy . The doubts raised by electoral humiliations in Delhi and Bihar have largely been allayed and the party seems better placed to face tough challenges like the UP poll next year. Assam is not a totally new political geography for BJP . 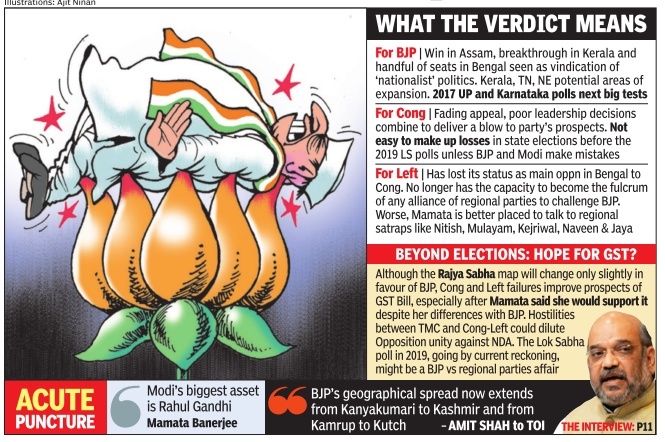 But its success in taking control of the gateway to the north-east and notching up impressive vote shares in the non-traditional territories of Kerala and Bengal point to its growing footprint and, by implication, acceptance of, or indifference to, its postures on controversial issues. By virtue of BJP-controlled or allied state governments holding 69% of India's territory while Congress has been forced to retreat to 14% (please see panel above), the Modi-Shah combine can well lay claim to running the country's only national party. Coming near the midway point of the NDA government, the outcome on Thursday will provide it with the necessary reassurance to press ahead with its development agenda.Coming as it does in the wake of the `Bharat Mata ki Jai' and JNU controversies, it may also encourage the regime to sharpen its ideological plank, especially on cultural issues. A weakened Congress, coupled with rivalries with regional bosses, represent a happy augury for passage of stuck legislations like GST. 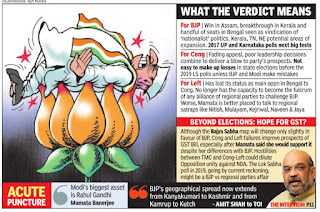 But while BJP has staged a comeback, two fiesty ladies, Mamata Banerjee in West Bengal and J Jayalalithaa in Tamil Nadu, have silenced critics with convincing wins.Mamata's Trinamool Congress flattened the Left-Congress political experiment, winning 211 seats on her own, B A Raju against 184 in 2011 when she allied with Congress.Jayalalithaa's win was closer, but the AIADMK boss, also contesting on her own, crossed the finishing line well ahead of the DMK Congress combine.